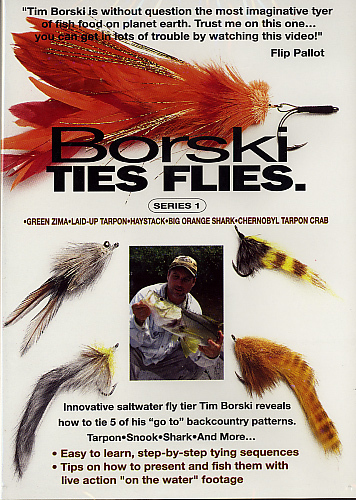 The name Tim Borski isn’t new to you if you’ve been tying flies (or possibly simply fishing) for any length of time. This is the first DVD in a two-part series. Tim, an Islamorada, Florida resident, is an accomplished artist, writer, speaker, fly designer, and fisherman. This first DVD introduces the viewer to five flies: green zima, laid-up tarpon, haystack, big orange shark, and the Chernobyl tarpon crab. I really enjoyed the way the video was put together. Each fly is introduced to provide you with its background. Next Tim moves into a quality step-by-step assembly of the fly describing each step along with tips to make your tying experience more enjoyable and productive. Finally, the segment takes a turn from where few if any other tying videos go. Once you have followed the tying of the fly, Tim takes you on the water to demonstrate how to present it to the fish. It’s a wonderful experience to not only enjoy the fish as they’re leaping through the air but also to see how to strip to give it the action that was designed into it. Overall I think this is a fine DVD. If I had to name one thing that could use improvement it’s the detail. I’m a stickler for detail and I really would have enjoyed some up close and personal shots of the tying process. The camera is set back from Tim as he ties and I think it really could have benefited from some close-up shots. Regardless, I give Series 1 two thumbs up!